Located on Water St. in Henderson, I came across their beers while in Aces and Ales. While looking over the menu I noticed a local brew called HopAtomic. After visiting their taproom, it left me thinking why aren’t more taverns highlighting local brews. This brewery started in early 2016 and I’m sure will be around for a long time. With over 20 yrs experience, master brewer Richard Lovelady, will continue to produce beers that Las Vegas will be proud of. Stop by to get 4oz flights and pints, with my favorite being the Tres Amour, a fantastic Belgium Triple. Growlers and 32oz cans are available to go and look for some of their beer in stores near you. Make sure to ask Linda Lovelady the story behind their Pecan’n of Age Porter and let them know TalkingHops sent you. 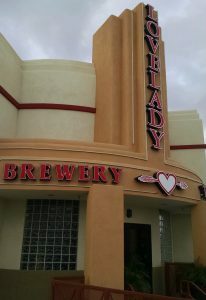 Thank you Richard for the tour you gave us and long live Lovelady Brewing Company.